Much has been made of Amazon’s entry into Australia, and share prices for retail stocks reflect the fear and uncertainty held by investors. Some retailers are better placed to cope with Amazon than others. So have some companies been oversold recently and therefore represent an opportunity? Greencross (ASX:GXL) is one such company that has a service offering that cannot be delivered online. Greencross is Australasia’s leading specialist retailer of pet food, pet related products and pet accessories in Australia and New Zealand. It also operates Australia’s largest veterinary services business. This contains over 160 clinics including general practices, specialty and emergency centres, pathology labs and pet crematoria. The Company’s retail network includes over 230 stores, operating under the brand names of Petbarn and City Farmers in Australia and Animates in New Zealand. A key aspect of the Company’s growth strategy is co-location strategy (i.e. having a veterinary clinic within the retail store). At present, in-store veterinary clinics comprise around 10% of the veterinary divisions’ revenue base, having expanded the number of in-store clinics from 3 in FY15 to 37 in FY17. Over the longer term, Greencross has a target of 120 in-store clinics, supported by the strong revenue/traffic indicators for the current in-store clinic network. 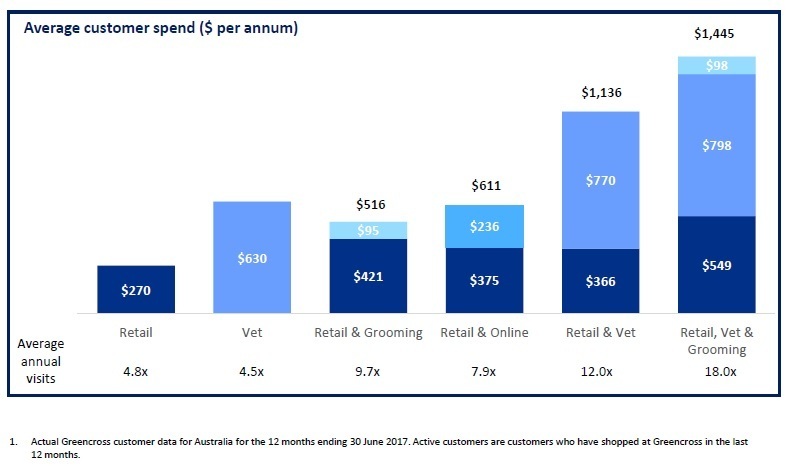 In particular, in-store clinics have double the number of clients who also shop in retail compared to stand-alone veterinary clinics and the average annual veterinary spend is >10% higher for clients at in-store clinics than for stand-alone clinics. How has Greencross Responded to Amazon’s Entry? In theory, the expansion of the co-location strategy and merged loyalty programs increases the alignment of customers to veterinary clinics and represents a service offering that cannot be delivered online. Whilst this is one defence to the entry of Amazon, there is still more work to do over the next 6-18 months in regards to improving its IT infrastructure and in-store experience. In particular, Greencross intends to replace its Point-of-Sale to allow for better inventory tracking, increase the number of stores with online fulfilment to improve delivery speed and continue with the rollout in-store clinics towards its long-term target. Weakening margins across both the Retail and Veterinary divisions in FY17 indicate that challenging retail conditions, which have weighed on sentiment for some time, remain. Furthermore, margins are expected to remain flat, due to growth in online competition for the retail-only portion of Greencross’ earnings. Greencross is having to lower its prices as a result. This is necessary on order for the Company to remain competitive and protect its market share. Improvement in retail conditions. Whilst FY17 results showed an improvement in comparable sales, Greencross’ earnings are highly sensitive to any decline in sales growth. This is given the significant investment undertaken with regards to the expansion of the in-store clinic network and retail network. The more that Greencross continues to expand its co-location strategy, the more likely it is to have an offering that cannot be replicated online. It is worth watching to see how this strategy progresses. Any movements yet on the chart? The chart for Greencross is already showing some signs that the market is anticipating some successful progress on the ‘Amazon defence’. From its 2017 peak of $7.35 in March, Greencross has been trending lower but you will notice that the range is tightening up, resembling that of a “falling wedge”. This is the same pattern that we identified with Flight Centre earlier in the year when it was in the lower $30’s (now trading in the $40’s). It appears as though the stock is breaking out of this formation. If that is true, then we could see the shares recover to over $7 in the next few months. Although we don’t have evidence yet that our key catalysts are being met, the market appears ready to put some faith in the strategy here and make an early move back into Greencross. Any advice is general only. As an optometrist, I would say co-location strategy defence is weak. Service provided and a retail product are separated. How many people get their eyes checked, get their prescription and go shop elsewhere or online? Interesting article. I agree that GXL wont be such a push over for Amazon however I think you have left off a couple of Key points. Firstly 87 per cent of the group's sales are made on the group loyalty card. And secondly on weekends around 20% of owners shop at GXL store with their pets along for the ride. In my opinion while the in store vets are a plus its the pet/owner experience that Amazon can not replicate and one GXL would be well advised to expand on.